Our product range includes a wide range of silicone wrist band and rubber wristband. Available Colors Green, Blue,Red, Blue etc. We are the manufacturer, supplier, and exporter of Silicone Wrist Band. 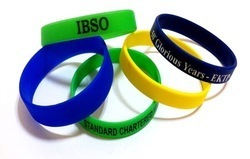 Our offered Silicone Wristband also can be customised as per clients requirement. Silicone wristbands are a very popular as the modern promotional tool (like advertising, branding & identification). These include debossed and embossed silicone wristbands, as well as glow in the dark and multi-colored wristbands. Our wristbands are very stylish and will be a sure-fire hit with people of all ages. They will be kept and worn over and over again which means that your promotions continue long after they have been handed out.